Okay, that was lame. Please forgive me. What ISN'T lame, however, is the fact that this tablecloth was given another life into 8 custom totebags for a bride and her bridesmaids ((and one extra for whomever she likes...because there was extra fabric and I like to make things in even numbers)). Have I mentioned that I love custom orders? Because I DO. Get it? "I do?" Wedding? See what I did there? Eh? The Awning Tablecloth is a super sturdy cotton and polyester fabric that was woven into a nautical looking tablecloth. I had to do some extra work to make it not come unwoven on the inside, but I love how they turned out, don't you? 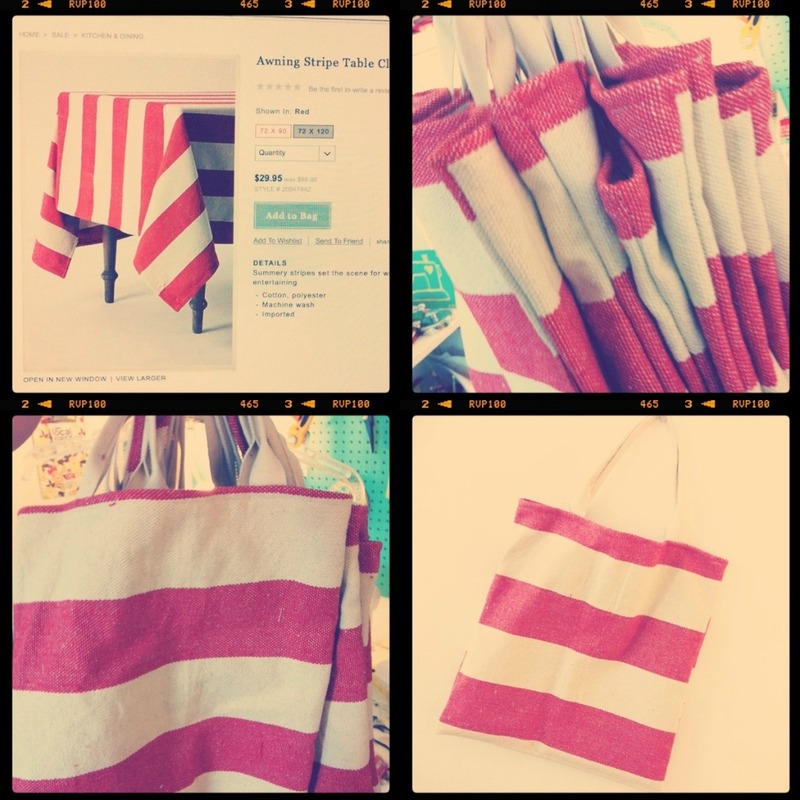 Perfect beach totes. Last week, I made this tote for myself out of two sale napkins at anthropologie (where else??). It's so fun to be inspired by different textiles and dream up something different for them. What's something that you've given "new life" or a different use for? I have just finished making a couple of totes too!! One was from recycled jeans - love using old jeans for a new purpose!! LOOVE those totes! I especially love the one you made out of the anthro napkins! Ugh, I haven't done any DIY in awhile. Wish I had more time in my days! I wish I had the sewing bug... my sister got that one, she would love this idea. I on the other hand spend all of my time turning books into beads. adorable! I need to do this! I love your tote bag out of napkins! I recently made a skirt out of my mom's jumper. i've told you once, i've told you twice - love that tote bag! How lovely!! You are so talented Kim!! you are sooo crafty! love the totes!! don't know that i've ever given new life to anything other than my kiddo but i love your stuff! I'm impressed! Love what you did :) I'm visiting from Vignettes. You are so sweet to offer up ad. space for her Giveaway. I could really use some! Can't wait to browse around here some more!